The word Ranu Agung derived from Indonesia Language “Ranu” meant Lake and “Agung” meant Great, It is located on the middle highland that surrounded by mountains, It is has a fresh temperature and supported with green views, calm water lake also possible for swim for visitors who have hobby in swimming. It is also known as the best camping place in Java Indonesia, like the camping on Kumbolo of Semeru Volcano. 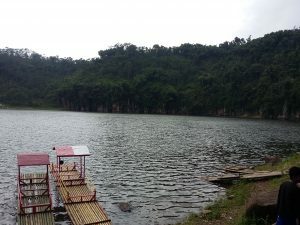 The facility is consist of Camping Area, Public Rest Area that confronting the lake views, Local Food stores, small and medium sail boat that convenience for a couple who celebrating their romantic relation, If you have a desire to refresh your saturation, Ranu Agung Camping, Probolinggo is the one lake should be tried. Ranu Agung Tiris East Java has a very beautiful natural scenery, with high cliffs on one side. This Rest Place in Probolinggo very interesting, and spoil your eyes, You will feel surprise because the around side have filled with hills and trees greenly, the best time to enjoy this tourism object is in the morning and afternoon wherein the weather normally clear. If you have planning to see the Ranu Agung Probolinggo, You must prepare a good camera to get a perfect photography with the cliff background and high hills, You can also make a pose while swimming on the lake water. Near from Ranu Agung Tiris East Java, You will meet with a green Tea Plantation normally called “Perkebunan Teh Andung Biru” meant Andung Biru Tea Plantation. This Tea plantation located still in Tiris Subdistrict Probolinggo, You can take the same route to this tourism objects or you can reach from Pajarakan District (direction Paiton or Banyuwangi) and takes about 34 minutes from Kota Probolinggo, from Pajarakan junction, you can turn right toward Genggong Islamic Boarding Centre. From Genggong you continue till towards Krucil, in this Krucil you will find a junction to the left and to the right towards Bremi towards Tiris. You take the route leading to the Tiris District . Arriving in Tiris area you will find the Police Station and Market Tiris, from Tea Gardens, you can continue to meet with Welding blessed and then you will find a market Krempyeng (the term small market) and near the market encountered small waterfalls, from here you will find the T-intersection again and you take the path to the right, you can proceed the location of Green Tea Plantation of Andung Biru. For the terrain and route to Ranu Agung Probolinggo, Andung Biru Tea Plantation are still quite steep and still not in good paving. the most suitable vehicle to reach these tourism place is Trooper vehicles, Jeep or Hartop and you can also use the Motorcycles. because if you use private vehicles such as Jazz, deer and the like cause for concern Inova your vehicle will get stuck on the way to the Tea Gardens Andung Blue. If you are interested to enjoy other popular places in Java Indonesia, You can read the combination Bromo tour package option below that possible reach from Bali, Surabaya, Jogjakarta and Banyuwangi Harbor. Detail information about the Ranu Agung Java Indonesia, Mount Bromo Tour Package option, Accommodation, Tour Package option, You can visit Our Contact.